Mai Tran, a research assistant in the Department of Anatomy and Neuroscience, School of Biomedical Sciences, is one of the public faces of the Skyline Foundation – a charity that supports talented students from disadvantaged backgrounds during the last two years of their secondary studies. When Mai was undertaking her VCE studies seven years ago, her father passed away from lung cancer. Mai decided to apply for a Skyline Foundation scholarship to help alleviate the financial burden on her family and allow her to prioritise her study. With the support provided by the Foundation, she went on to successfully complete her undergraduate degree at the University of Melbourne and a Master’s degree in Science. 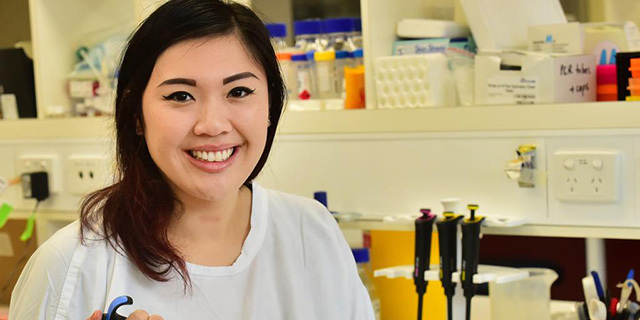 A former intern at the Peter MacCallum Cancer Centre, Mai currently works in the Fletcher and Young laboratories, working in the areas of stem cell and cancer biology. She is currently pursuing Ph.D positions overseas and aspires to educate the next generation of Australia through a lecturing position in the sciences. The Skyline Foundation provides bursaries to help gifted individuals through their VCE studies. As chairman of the Skyline Alumni committee, Mai values the support she received from Skyline, acknowledging that her achievements would not have been possible without the foundation. “Skyline were the first people, who weren’t my family, who said I was worth something,” she said. She hopes to make more disadvantaged students aware of the opportunities the foundation can offer and the places it can take them.